November 6 is the 310th day of the year(311th in leap years) in the Gregorian calendar.There are 55 days remaining until the end of the year. 1856 – Scenes of Clerical Life , the first work of fiction by the author later known as George Eliot, is submitted for publication. 1947 – Meet the Press , the longest running television program in history, makes its debut. AD 15 (XV) was a common year starting on Tuesday of the Julian calendar. At the time, it was known as the Year of the Consulship of Caesar and Flaccus. The denomination AD 15 for this year has been used since the early medieval period, when the Anno Domini calendar era became the prevalent method in Europe for naming years. 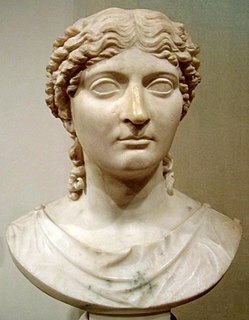 Agrippina the Younger, also referred to as Agrippina Minor was a Roman empress and one of the more prominent women in the Julio-Claudian dynasty. 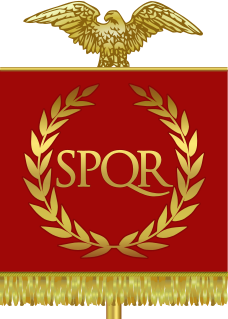 Her father was Germanicus, a popular general and one-time heir apparent to the Roman Empire under Tiberius; and her mother was Agrippina the Elder, a granddaughter of the first Roman emperor Augustus. She was also the younger sister of Caligula, as well as the niece and fourth wife of Claudius. Li Yong (李永), formally Crown Prince Zhuangke (莊恪太子), was a crown prince of the Chinese dynasty Tang Dynasty. He was the oldest son of Emperor Wenzong. St. Illtud, also known as Illtud Farchog "Illtud the Knight", is venerated as the founder-abbot and teacher of the divinity school known as Cor Tewdws, located in Llanilltud Fawr in the Welsh county of Glamorgan. He founded the monastery and college in the 6th century, and the school is believed to be Britain’s earliest centre of learning. At its height, it had over 1000 pupils and schooled many of the great saints of the age, including Saint David of Wales, Gildas the Historian, and Samson of Dol. Blessed José María de Manila is a Spanish-Filipino Roman Catholic blessed, and was priest of the Order of Friars Minor Capuchin. He was martyred in the early phase of the Spanish Civil War, and is the third Filipino to have been declared blessed by the Roman Catholic Church. Barlaam of Khutyn, also known as Varlaam, was a hermit. Born Alexis Milchalevich to a wealthy family from Novgorod. After the death of his parents, he became a hermit on the Volkhov and handed all of his inheritance to the poor. At this time he had gained many followers. So great were their numbers that he founded a monastery, the Khutyn Monastery of Saviour's Transfiguration, and took the name of Barlaam (Varlaam). He died on 6 November 1192, his grave has become a site for pilgrimage. Saint Demetrian is a saint from Cyprus. In the 9th and 10th centuries, he served the Christian Church as a monk and an abbot, and ultimately as the bishop of the ancient city of Khytri. He is venerated for his apparently miraculous rescue of Christian Cypriots who had been enslaved by Saracen invaders. Emilian of Faenza, Irish pilgrim and bishop, fl. 7th or 8th century. ↑ "Goth Pioneer Rozz Williams Hangs Himself". Rolling Stone. Retrieved 2 Nov 2018. ↑ "Conchita Wurst: Biography". ConchitaWurst.com. Archived from the original on 25 May 2015. Retrieved 26 May 2015. ↑ "Who Is Hero Fiennes Tiffin? Everything You Need To Know About The 'After' Star". ELLE. Retrieved 9 March 2019. Wikimedia Commons has media related to November 6 .